Camping is fun. I prefer going to unimproved areas and "boondocking" or dry camping without hookups. Often I have beautiful scenery and blessed quiet mixed with all the comforts of home. Sure sounds like a win-win scenario to me! One day as I was having my morning coffee, looking out at a pretty vista through my window, and I got to thinking. What other places would having your RV be a great boon? Surprisingly, there were lots of places that came to mind! Aside from the "parking lot surfing" of your local (and not so local) WalMart and big box stores, you could always go to a sporting event and have the ultimate tailgating machine. Think about it... a full kitchen with a decent sized fridge and a complete bathroom facility. Your own! Not some plastic portable potty that likely smells like what it's for. You've got your own food, cooking devices, tables, awnings and a place to escape into if it rains! What else could you need or want?!? OK, what about casinos? Many, if not most of them will allow you to park for multiple nights while using their facilities. Some of them even have full-on RV parks you can use! Have several meals, maybe gamble a bit. See a show, go people watching and then back to your own home away from home when you return. No packing and unpacking. Just park and go have fun! Casinos not your thing? OK, how about a concert or music festival? Some let you park for free, some charge a small fee. Get there early and find a good spot then relax, make lunch, watch some TV, go out and meet your fellow revelers. Go to the festivals activities and when it's all done (or several times during) strategically retreat to your oasis. Use the restroom, eat, shower... whatever you like. Perfect. How about a Renaissance festival? These are quite popular around the country and there are some HUGE ones. How about experiencing that era AND having a location that ISN'T in the middle ages to microwave a meal... charge your phone. Sleep in a warm bed or have some air conditioning at your disposal. Even if you are a die-hard fan, a place to store your present day stuff while you're out is a great thing. Changing room anyone? Not your cup of tea? How about having a leisurely visit to a museum? I personally like Air and Space museums. I've done quite a few trips to some "out of the way" places that had fantastic exhibits. Most of the time, the owners, managers, staff will invite me to stay in their parking lot. Of course, you should ALWAYS ask first, but you'd be surprised what a simple friendly conversation will bring! You can be right next to the action! Awesome. Of course there is always the RV convention. There are so many of these around it's hard to keep track of them all. They almost always have overnight parking and you get to see lots of new models and accessories. Some are so large, it's nice to know you have a place to rest. Especially if it's a hot day and you are walking miles and miles to see the latest and the greatest. How about Outlet Malls and Mega Stores! Park there for a day or a few days and shop till you drop! Tired feet? Retreat back to the RV. Want lunch? A cold drink? A Nap? Back to the RV! Drop off your heavy bags in the RV and go shop some more! Maybe only one of you wants to shop? OK... stay in the RV and watch TV or... whatever. Win-Win! Emergencies. This can be a very serious use for an RV. Natural disaster, storms, floods... you name it. If it can hurt you or your loved ones and friends, why not hop in the RV and light out to greener and safer pastures until the emergency passes? Obviously, this is a VERY short list! Your imagination is the only limit, I'll bet you can come up with LOTS of things you can do with an RV. Taking your home with you certainly has it's advantages. That sounds like the perfect weekend. Aircraft, RVs and comfort! Perfect!! I'd love to look you up, but as "Anonymous" it would be hard! Our RV is parked in our driveway, and it is always at the ready should we have to evacuate. After every trip, the tanks are dumped, the diesel topped off, and the fresh water filled. 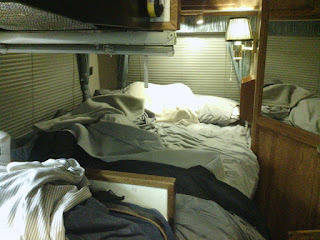 The kitchen and bath supplies are always replenished, and we keep changes of clothes in the RV on a permanent basis. Nothing to do but raise the jacks and start the engine. Planning ahead is always a great idea! That's the thing about the unexpected...it's..well...unexpected! !